Daniel Everest, Head of Digital Innovation at Kings Ely school in Cambridgeshire, UK, explains how Britannica resources have helped his teachers and students at the school. What was the challenge your school faced? When I started at Kings Ely two years ago, I noticed that the students used various websites to gather research information, one of their main go-to sites was Wikipedia. There are lots of conversations currently regarding Wikipedia and its reliability, so I wanted to point the students who are aged between 7-13 years old to one site which could suit all of their needs and abilities. Having used Britannica in my previous school in Germany I knew the product would suit our school’s needs. How has your institution benefitted from using Britannica? 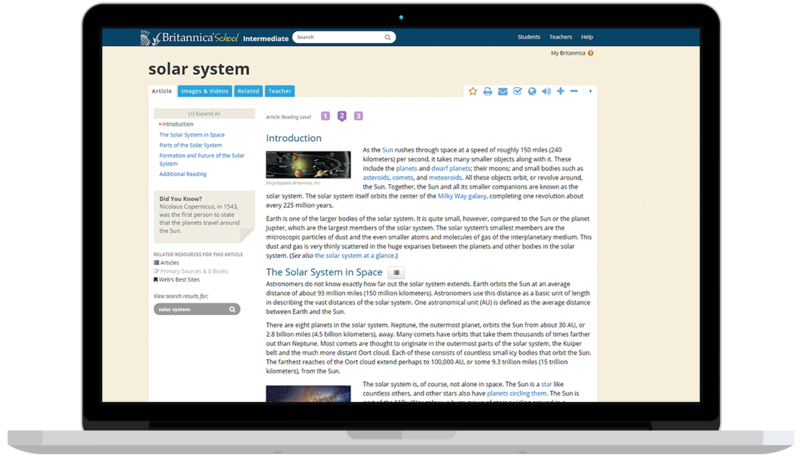 Students now have access to a first class online encyclopaedia full of resources, and both students and parents are now using Britannica at home to aid with homework and lesson preparation. The tools available within Britannica resources were key for us when we were making our decisions. The differentiated reading levels which meant students from Year 3 to Year 8 could all use the same resource. The reading out loud tool also adds extra support for all students if they require. Being able to get quickly get definitions of words with the built in dictionary tool and the quick citation tool is very useful, especially for the older students who need to know how to cite their work correctly to prepare them for further education. Now that we have Britannica, I have received positive feedback from parents who use Britannica regular at home for preparation. I launched Britannica with my Year 7s and 8s via project work in which they had to research an important person in the tech world and create a professional presentation on them. Both year levels started their research using Britannica School, before they used any other sources. This meant they had a solid foundation for their project. The students were then able to easily cite references in their required bibliography. Britannica is easy to use and the fact that students can self differentiate content levels to suit them is a big plus. Britannica School has helped Kings Ely School students and teachers, and we would love to show you how we can help your school. For a short, free demo click below and one of our team will be in touch to arrange a time to suit you.